As most doodlers, I believe, I’ve started my practice with the sketchnoting of live events. The first experiences I had with this were for a series of 1-2h long university meetings in Bologna and Bari, made for career guidance for students and recent graduates of my faculty. For these sketchnotes, I used a typical blank page, 13x21cm Moleskine. At first, I was maybe too keen on capturing too many details (something which actually goes against the spirit of visual note-taking), creating extensive sketchnotes at the expense of losing some key point from time to time. Furthermore, I still had to gain confidence about my drawings and when the pace was too fast, I switched from pen to pencil, despite I had a clear idea of what to draw. 2: I had to be faster with drawings and enrich my visual vocabulary! As I practiced more and more, especially with TED videos at home, I could improve in synthesis and writing skills, trying to catch only the essential part of the speech and shortening sentences when the speaker’s words could be expressed more simply. Furthermore, thanks also to the good advice contained in the verbaltovisual.com course by Doug Neill, I started piling up a series of icon to create my personal visual vocabulary. In this way I started drawing more often, more rapidly and more confidently in my sketchnotes without losing time and focus and risking missing key points. 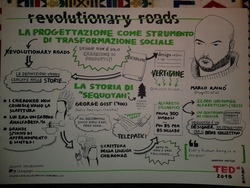 The biggest opportunity to test this presented last October with TEDx Bari, where me and my colleague Giuseppe Berardi managed to get invited to sketchnote all the speeches on big A3 format sheets. To tell you the truth, we did not receive any aid to facilitate our work; being the first edition of the event, organized were almost as unprepared as us. We didn’t have any clue about the speakers’ schedule and they could give us only small hints about what they would have talked about. Furthermore, because of tickets overselling, we were forced to watch the morning speeches in a cinema appropriately arranged for live streaming, with frequent video interruptions. Nevertheless, we made this a challenging and rewarding graphic recording experience. Giuseppe prepared portraits of the speakers to stick them on the sheets and we equally divided the number of speeches to record between us. It was a very fast-paced process, with only four breaks between 16 speeches and never knowing if the next one was to be visualized by me or Giuseppe. I used these pauses, as well as Giuseppe’s turns to sketch, as downtime to add missing details to previous sketchnotes of mine; I was still so worried about the result that I kept using pencil in this occasion. Anyway, we were able to finish all the sketchnotes almost in time for the end of the event and stick them to the wall for showing. Lesson 1: Try to get prepared as best as you can before sketchnoting an event (e.g. prepare templates with a proper title and author’s portrait; get some info about the speech content; gather icons that can be relevant to the topic). Lesson 2: Despite the aforementioned preparation, be flexible and ready to face any inconvenient that can challenge your graphic recording session. You can create also powerful real time sketchnotes if you watch the event comfortably from your home. I was going to attend a convention in Padua organized by the university, named “SciPar – per una scienza partecipata” and focusing on science and research outreach. Eventually I could not go there, so I decided I would make sketchnotes of the speeches watching them on live streaming online and sharing their pictures on Twitter immediately after finishing one. This strategy imposed me to work fast, drawing mostly with pens and markers and without worrying too much on appearance, in favour of clarity and effectiveness. The result was awesome! Twitting sketchnotes made me gain tens of followersand a lot of positive feedback and visibility. 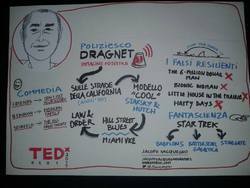 Some days later I was even asked by the collaborators of one of the speakers at SciPar (the dear Prof. Cristina Rigutto) to make a sketchnote for her talk at TEDx Assisi. If you cannot be present at an event you intend to sketchnote, try in any case to watch the live streaming (if there is one) and tweet your sketchnotes’ pics in real time; results in terms of idea sharing and visibility are really worth it. 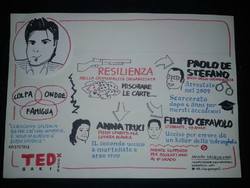 Lastly, I want to tell you about the sketchnotes I made for TEDx Lecce at the beginning of this month. Initially, I tried to strike an opportunity for working as a supported Graphic Recorder. However, things went very differently and I couldn’t get the opportunity. I went there trying to do a good sketchnoting job on my own though, but I was in a really uncomfortable position, couldn’t focus on the speeches and eventually got discouraged and gave up. Nevertheless, I started to take brief notes of the speeches anyway, and I used the same notes later in the next two days to create some of the best sketchnotes I think I’ve ever made. And this time, I used exclusively pen and markers, getting a satisfying result without worrying about typos or drawing mistakes! If you are still interested in creating sketchnotes and publish them after a graphic recording session went bad, you can still take normal notes and visualize them later to save part of the job. These are my personal experiences and what I’ve learned from them. I hope you can find them useful.